Para tertiary butyl Calix arene is produced by base induced condensation of p- alkyl phenol with formaldehyde. Calixarenes generally are basket or vase shaped macrocyclic compounds of potential interest for host-guest complexation studies. Calixaranes have hydrophobic cavities that can hold smaller molecules and ions. With modification, Para tertiary butyl Calix arene derivatives exhibit great selectivity towards other cations and form complexes with lanthanides and actinides. Therefore, Para tertiary butyl Calix arene is the most accessible of all known macrocyclic cavity-containing compounds for preparation of calixarenes carrying variety of groups both on upper and lower rims. 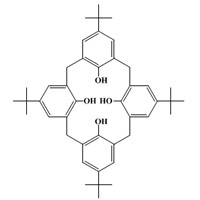 Calixaranes are used in ion sensitive electrodes or sensors, optical sensors, etc. Para tertiary butyl Calix arene is also manufactured in india in the outskirts of Bombay approximately 120 Kms away on western highway at Plot No E-111, MIDC Tarapur Industrial Area, Maharashtra, India. Para tertiary butyl Calix arene is the Starting material for further derivatization, including halogenation, acylation, and diazo coupling. Appearance White to light beige colour crystalline powder.